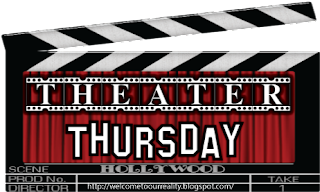 Welcome to this week's edition of Theater Thursday! With it being St. Patrick's Day we're going for a boost of Irish! 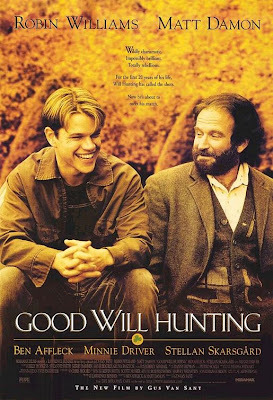 This week's featured movie is Good Will Hunting. Will Hunting (Matt Damon) is a Boston boy working as a janitor at prestigious MIT. What most people don't know about him and what he doesn't even realize himself is that he has an uncanny ability for solving math equations and chemistry. His skills are so good they shock a highly skilled and brilliant math professor who decides to work with Will. Will not wanting to leave his sound end Boston home or his buddies like Chuckie (Ben Affleck). Along the way of his path of self discovery he meets a gorgeous girl (Minnie Driver) who makes him work towards the brass ring. All the while, wanting to stay the same for his buddies and not please people of authority who he feels are only looking out for themselves. I love this movie and think that the Boston Irish accents rock it even more! Happy Saint Patrick's Day everyone!! I haven't seen this movie in years, but I remember that I really liked it! OH yeah! This was like my favorite movie for awhile and really fueled my Ben Affleck/Matt Damon crush. Haha I was JUST about to say what tootie said! I have never watched this... can you believe it?!? I know i would totally love it, too. Perhaps i'll add it to my Netflix Que! Oohhhh, I love this movie! Such a good one. ahh I love this movie! Ooh, I love this movie!! I tend to quote the "Do you like apples...?" line all the time! LOVE the accents! Seriously one of the best movies EVER! I love love LOVE this flick. I bet I use this line once a month. I LOVE THIS MOVIE. oh wow that wasn't supposed to be in caps lock. But anyway, I was just talking about the scene in the bar where Matt Damon puts the smack down on the Harvard student. I love this movie! It's one of my absolute favorites! 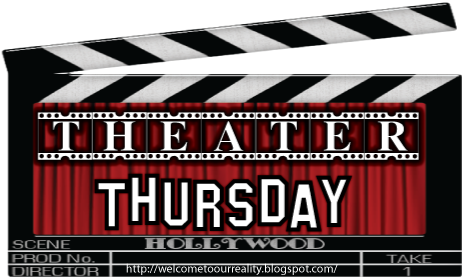 The 100th Theater Thursday Giveaway! Won't You Wear My Ring?